Summary: There is a big potential danger in the levels of confidence exuded by the Labour Party these days. Labour must be very careful making statements that might alienate their core supporters and particularly the young activists who were so key to the recent electoral success. The poll lead for Labour is not as big as the wildly optimistic feelings of so many of their supporters. Jeremy Corbyn’s ambiguity about Brexit is something that is best to maintain. Labour has done well in being ambiguous and nuanced about its position on Brexit and it really must maintain that. There is a great deal of optimism and confidence in the Labour Party following their near-win at the last election. The danger is over-confidence. We must remember that the Tories will regroup, they will come up with policies that are much more moderate particularly when they change their leader. That change is likely to come relatively soon. We can be confident that the right-wing media will continue their overt and intentional distortion of reality to support the Tories as well as an extreme form of Brexit. Only today, Theresa May tried to pour scorn on many Labour policies which in fact are very popular. The days of neoliberalism are gone (see here for a children’s guide: http://outsidethebubble.net/2016/09/22/neoliberalism-a-beginners-guide/). We should be under no illusions that the next election battle will be tough. Labour made very effective use of the burgeoning younger membership of the party who understood social media so much better than the Tories. Next time round the Tories will no doubt make a better fist of things given the resources they have. In the meantime it is critical that Labour does nothing to alienate their young activists. The younger generations are generally very pro-Europe, pro-Remain. This means that Labour and Jeremy Corbyn really must avoid unnecessarily rigid, inflexible statements about Labour’s policy on Europe and Brexit. The mood of the country is increasingly turning away from Brexit. It can be left to go further in a short-term without any nudging from Labour. The Tories are managing to do everything that Labour might want to make Brexit the disaster that so many of us think it will be. Once Labour leads a government it will become responsible for the Brexit negotiations. There will be a great deal of goodwill from the European side given the extraordinarily incompetent way that the Tories have managed the business of negotiating Brexit so far. Many European countries would welcome changes within the EU and a pragmatic and thoughtful Labour-driven Brexit discussions may well be able to help articulating changes that would be more popular than simply providing for an adequate Brexit. Keeping that flexibility alive now will be very important in the future. Maintaining that flexibility will also undoubtedly improve Labour’s appeal to its many young activists. These activists must be kept energised and enthusiastic right up to beyond the next election. They must not be taken for granted or be marginalised because of the overconfidence that seems to be rampant within the Labour Party today. 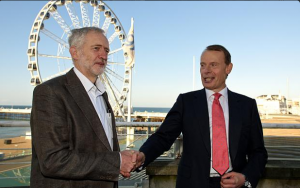 It seems unlikely that Jeremy Corbyn can, in fact, walk upon the water. I agree completely. One of the biggest problems I feel is that people have short memories, even young people, and therefore however they feel now will not necessarily last. Corbyn is like a breath of fresh air at the moment but as we all know too well, this air can easily become polluted.